Motoori Norinaga (Japanese: 本居宣長; June 21, 1730 – November 5, 1801) was a scholar on Japanese classics, philosopher, and poet during the time of the Tokugawa Shogunate. He identified the essence of Japanese culture and people with a particular emotional sentiment and conceptualized it as mono no aware (the sorrow which results from the passage of things). He found this emotional sentiment as the basis of particular aesthetic sensitivity of Japanese culture. For Norinaga, the essence of human nature was not the rational capacity, but the emotional sensitivity in heart, which was the source of poetry. One can find this original realm only when one reaches pre-conceptual, pre-linguistic level. From the thirteenth to the sixteenth century, Japanese scholarly research of the ancient Japanese classics was greatly influenced by Buddhist and Confucianist concepts from abroad. During the Edo age, which began with the Tokugawa shogunate in the seventeenth century, several eminent scholars started to rethink these attitudes and closely examined their methods of research. This gave rise to the Kokugaku ("national learning"; the study of ancient Japanese tradition and classics) movement. Motoori Norinaga established the hermeneutic methodology which sought to eliminate preconceptions, prejudices, and ideologies when examining ancient Japanese classics. He contended that a scholar who was influenced by foreign ideologies, especially Buddhism and Confucianism, failed to grasp the real spirit of the Japanese classics due to preconceived interpretive devises. His uncompromising attitude of sincerely seeking for authentic meanings and values of Japanese spirit inspired other scholars to begin a renaissance of Japanese classical studies. Motoori Norinaga’s ideas had a deep impact on the studies of Shinto, the oldest Japanese religious tradition. Norinaga was born in Matsuzaka of the province of Ise (now Mie prefecture). He was the first son by birth, the second son of the Ozu merchant house of Matsuzaka. He had an adopted elder brother. His father died when he was 11 years old, and his mother encouraged him to go to Kyoto to study medicine when he was 22. In Kyoto he also studied Chinese and Japanese philology (the scientific study of literature and language) under the Neo-Confucianist Hori Keizan, who introduced him to a book by Keichu about ''Manyoshu'' poetry. He was inspired by this book and by the writings of Ogyu Sorai, and decided to devote himself to Kokugaku ("national learning"). Chinese influence had altered the Japanese language so that the ancient texts could no longer be understood without careful linguistic analysis. In Kyoto, Norinaga also developed a love of traditional Japanese court culture. Returning to Matsuzaka, Norinaga opened a medical practice for infants while devoting his spare time to lectures on the Tale of Genji and studies of the Nihon Shoki (Chronicles of Japan). He adopted the name of one of his samurai ancestors, Motoori. At the age of 27, he bought several books by Kamo no Mabuchi and embarked on his Kokugaku researches. In 1763, Mabuchi visited Matsuzaka and Norinaga met him in person. This meeting, known as 'the night in Matsuzaka,' changed Norinaga's direction and his method of study. Norinaga asked Mabuchi to edit his annotations to the Kojiki (Records of Ancient Matters). Instead, Mabuchi recommended that he first analyze Manyoshu (ancient poetry) in order to gain an understanding of "manyogana," ancient Japanese language. With Mabuchi's encouragement, Norinaga later entered into a thorough study of the Kojiki. While conducting his activities as a Kokugaku scholar, Norinaga spent 40 years as a practicing doctor in Matsuzaka and was seeing patients until ten days before his death in 1801. Norinaga's most important works include the Kojiki-den (Commentaries on the Kojiki), written over a period of 35 years, and his annotations on the Tale of the Genji. Norinaga believed that imported Confucianism was in contradiction to the ancient Japanese heritage of natural spontaneity in feeling and spirit. 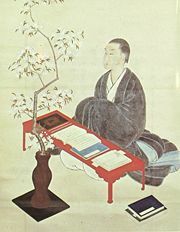 As a young scholar Norinaga followed Ogyu Sorai's method of stripping away Confucian concepts to find the true meaning of ancient Japanese classics. However, he criticized Sorai for continuing to be heavily influenced by Chinese thought and language. Until this time scholars of ancient literature had shown a preference for the grandness and masculinity of Manyoshu poetry and had regarded works like Tale of Genji as unmanly and feminine. Norinaga reasserted the importance of Tale of Genji as an expression of mono no aware, an intuitive, delicate sensitivity to the world. Since Chinese Buddhist and Confucian traditions influenced Japanese classics, Norinaga began to research by examining and trying to discover the authentic or original human nature in himself. Instead of trying to appear learned, he insisted on humility and faith in God. This attitude influenced his disciple, Hirata Atsutane, who later started a Shinto revival. Norinaga also named the concept of mono no aware, the sorrow that results from the passage of things. He saw it as a distinctive characteristic of Japanese people, revealed in classical Japanese literature. He found the essence of human nature, not in rational capacity (rationality), but in emotional sensitivity of heart. In Norinaga’s view, emotional sensitivity exists at a pre-conceptual, pre-linguistic level and is the source of human creativity. One can find it by stripping away all presuppositions imposed by concepts and existing thoughts. Japanese poetry is an attempt to express intricate and delicate emotions, which conceptual discourse cannot grasp. Norinaga’s identification of human nature with the emotional dimension shows a sharp contrast with the mainstream philosophical traditions of the West, which tended to identify human nature with rationality, or ability to think. 1748 - Norinaga is adopted by the Imaida family, but after only two years, the adoption reversed. 1752-57 - Some scholars note his productivity; Motoori produces two thousand ''Waka'' and 40 books and copies 15 others. 1757 - He reads the first book from Kamo no Mabuchi named kanji ko. Lacking money, he returns to his hometown to open a doctor's practice. 1760 - Arranged marriage with Murata Mika, but after only three months they divorced. 1762 - Marries Kusubuka Tami, and one year later their son Haruniwa is born. 1763 - He meets with Kamono Mabuchi, who tells him to read the Nihonshoki and the Manyoshu. 1764-71 - He studies the Kojiki; starting with this, he begins to spread his teachings. Eastman, Roger. The Ways of Religion: An Introduction to the Major Traditions. New York: Oxford University Press, 1999. Marra, Michele The Aesthetics of Discontent: Politics and Reclusion in Medieval Japanese Literature. Honolulu, HI: University of Hawaii Press, 1991. Matsumoto, Shigeru. Motoori Norinaga, 1730-1801 (Harvard East Asian series). Cambridge, MA: Harvard University Press, 1970. Nishimura, Sey. “The Way of the Gods. Motoori Norinaga's Naobi no Mitama.” Motoori Norinaga Monumenta Nipponica 46: 1 (Spring 1991). Tokyo: Sophia University. Norinaga, Motoori. Kojiki-Den (Cornell East Asia, No. 87) (Cornell East Asia Series Volume 87) Ithaca, NY: Cornell Univ. East Asia Program, June 1997. This page was last modified on 29 August 2008, at 15:01.